"Asatho maa Sadgamaya", - "Lead me from the unreal to the Real" - has been man's prayer to the Almighty since time immemorial. But what is the significance of the prayer? The concept of reality/unreality is enigmatic. For example, what is real in the waking state is unreal in the dream and vice versa. What is real in either in the waking state is unreal in the dream state and vice versa. What is real in either of these two states is non-existent in the deep sleep state. The unreality of the experiences in all the above three states of consciousness becomes evident in the transcendental state of ‘Turiya’. The noumenon alone is real for the non-dualist and idealist; while the phenomenal world is real for the realist and physical scientist. Stranger still is the fact that the "solid matter" which was reality to the physicist of the nineteenth century is nothing but deception according to the twentieth century physicist whose extremely sophisticated instruments reveal that what really exists is not solid matter but vast empty spaces interspersed with dancing 'wavicles' of energy. Interestingly enough, this latest "scientific" view of reality tallies with the Hindu's age old "spiritual" symbol of the cosmic dance of Nataraja. To get over this conceptual problem inherent in the idea of reality/unreality, and appreciate the significance of the above-mentioned prayer, it would be useful to consider the classification of reality as given in the Hindu scriptures. This Absolute Reality designated as Atma or Brahman cannot be perceived by the senses and mind, but can be experienced only, in the transcendental state (Turiya). The second category, namely, "Relative reality", a combination of Sath and Asath (reality and unreality) is subdivided into two types: (a) "Vyaavahaarika Sathya" i.e. empirical (or Practical) Reality, and (b) "Praatibhaasika Sathya", i.e. Illusory or Imaginary Reality. (a) Empirical Reality: Empirical reality refers to the phenomenal universe of names and forms, "Naamaroopaatmakam" (consisting of the five elements and their permutations and combinations), which has been projected into manifestation by Primordial Nature (Prakriti or Moola Avidya) according to the will (Sankalpa) of Easwara (the Lord of the Universe). This empirical or pragmatic reality consisting of personal God, man and the world, is generally perceived by the senses with the help of the mind and intellect during the wakeful state. The following six sub-categories belong to this category of reality. (i) Common examples of such empirical reality are: the three-dimensional objects with ‘substance’, both animate and inanimate, moving and stationary. This subcategory includes the subtle, inner world of mind, intellect and ego. Special examples are: (ii) shades, shadows and reflections, having no substance; (iii) sun-rise and sun-set (although the sun actually does not rise or set); similarly, waxing and waning of the moon, (iv) flowing reality (Praavaahika Sathya) as in the case of a river, our bodies or the world itself for that matter (appearing to be the same, though constantly changing); (v) temporary reality (Thaathakaalika Sathya) as in the case of a crow on a roof; and (vi) inferential reality (Anumaana Sathya) as in the case of seeing smoke and inferring fire; or seeing the moving branches and inferring the presence of wind. (b) Illusory Reality: Illusory reality (Praatibhaasika Sathya) is that which is created and experienced by the Jiva (individual soul), as a result of what is called “toola Avidya” (individual nescience). Examples of such reality are: dream, a creation of the mind; phenomena created by the senses together with the mind, such as a mirage mistaken for water, a rope mistaken for a snake, or a stump mistaken for a man, or a post seen as a ghost, because of inadequate light plus imagination. It is important to note, in this context, that the three entities of God, man and the world are posited by almost all religions. These three, according to Vedanta as well as Bhagavan Baba, belong to the realm of relative reality, since they are but the reflections of the one and the only Absolute Reality (Parabrahman, or Impersonal God without attributes) in the threefold mirror or Maya (cosmic illusion). God, meaning Personal God designated in Hindu religious texts as Saguna Brahman or Easwara, having form and or other attributes, is the reflection of Nirguna Brahman in the Sathwic aspect of the mirror of Maya; while man and the world are reflections respectively in the Rajasic and Thamasic aspects of the mirror or Maya, which is the inscrutable power of Parabrahman. Absolute Unreality: The third category, namely, "Asath" (absolute unreality) illustrated by the classical examples like "Vandhya Putra" (son of a barren woman). "Gagana Kusumam" (sky-born flower) and Sasi Vishanam (rabbit's horn) is merely of academic interest due to its non-existence. Such empty words or terms are generally used as figures of speech only to indicate things which do not exist at all. Viewed in the light of the above classification of reality, the prayer to lead us from the unreal to the real, virtually amounts a supplication for being lifted from the domain of relative or empirical reality to that of Absolute Reality. There are two approaches to the fulfilment of this prayer. The ostensibly short approach is altogether to deny the manifested universe as unreal by following the so-called ''Neti, Neti'' process, in an attempt directly to reach the Absolute Reality. However, according to the testimony of the Gita (12th Canto Verse 5), this direct approach to the Absolute Unmanifest Reality is fraught with insuperable difficulties for an embodied being. In fact, for the vast majority of spiritual aspirants with body-consciousness, this path of wishful negation of the world amounts to an exercise in futility and self-deception. For, unless one has attained purity of heart as well as annihilation of the ego and mind, one cannot hope to reach the transcendental (Turiya) state to experience the Absolute Reality. For the large majority of aspirants, therefore, the path commended by scriptures like the Gita, and especially by the Great Masters of modern times like Sri Ramakrishna and Bhagavan Baba, is to deify the world and not to defy, much less to deny it. After all, without the substratum of Brahman (the Absolute Reality), the world cannot exist independently. Therefore, the world would become unreal, if considered as something apart from God (Brahman), but real when seen as a part or as a manifestation of God. It means, according to Sankara, that "Brahman cannot be considered as existent (sath) as It belongs to no genus, nor does It possess any perceivable or conceivable qualities. At the same time, It cannot be considered as asath or non-existent. since It is manifesting Itself through all living and non-living beings." The same paradoxial truth is enunciated by Bhagavan Baba in the modern idiom as: "Everything is nothing; and nothing is everything." Here, 'everything' means the phenomenal world of names and forms. 'Nothing' denotes Sat-Chit-Ananada or Brahman, which is not a thing that can be perceived by the senses, nor conceived by the mind, as It transcends the senses and the mind as well. 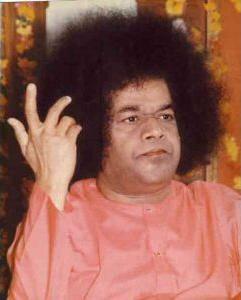 Therefore, Swami’s above statement declares that everything (world) is Brahman; and Brahman is everything (world). Again Baba's dictum is valid from the view point of the doctrine of Maya also. For. Maya, by definition is that which does not exist (Yaamaa Sa Maya). Accordingly. Baba's pronouncement amounts to saying that everything is Maya, and Maya is everything. And Maya, in turn, is equated with Brahman in the sense that it is considered as the inherent, inalienable and inscrutable power of Brahman. Hence, Swami's exhortation: "Drishtim Jnaanamayam Thadaiva Prema-mayam Kritvaa Pasyeth Brahma-mayam Jagat” which means, "Let your vision be filled with wisdom and self-less love and then you will find the world verily filled with Brahman." Needless to say, this requires the prolonged and unremitting practice of looking upon everything as God and God as everything, as well as conducting oneself accordingly in day-to-day life. So when we chant the prayer, "Lead me from the unreal to the real", etc. let us remember that according to the divine scheme of things, we have to reach the nameless and formless through name and form; or in Baba’s words: "Love and serve the Lokeswara (Lord) through loving and serving the Loka (world). Deify the world by seeing the unity underlying the diversity: and by treating duty as God and work as worship. More specifically, in your dealings with the world, practise the five virtues of truth, righteousness, peace, love and non-violence, both at the moral and spiritual levels, as well as the three maxims of love of God, fear of sin and morality in society". This is the way to reach the 'real' from and through the 'unreal'. When we thus reach the ‘real’ from the ‘unreal’, we would automatically be reaching ‘Jyothi’ (light) from and thrugh ‘thamas’ (darkness), and ‘amritham’ (immorality) from and through 'mrithyu' (death). For, the words Sath, Jyothi and Amritham in the universal Upanishadic prayer under discussion, stand respectively for Sath, Chith and Ananda (Being-Awareness and Bliss) which are but three inseparable aspects of the One Reality, as often explained by Bhagavan Baba. In the final reckoning, therefore, this prayer means that we should give up our undue obsession with the diversity which is characterised by unreality (asath), darkness (tamas) and death (mrithya), in order to perceive and experience the underlying unity consisting of Sath-Chith-Ananda or Absolute Being-Awareness-Bliss. This, indeed, is the spiritual significance of Swami's unique play on His name SAI BABA, as an acronym standing for: "See Always Inside, Being Awareness Bliss Atman". It means that if we develop the inner vision, we can see the Sath-Chith-Ananda Atman in everything, everywhere, ever. May we always remember this Sapthakshari (seven lettered) Divine Mantra.